Social Enterprise Greenhouse recognizes 6 companies in the first year of their Best for Rhode Island initiative. The awards took place at the Greater Providence Chamber of Commerce Economic Outlook Luncheon on Monday, September 24. The 6 awardees were recognized for their outstanding achievement in using their business as a force for social and environmental good. The Best for Rhode Island initiative is a statewide campaign that educates and equips businesses to assess and improve their positive social impact. Through a confidential online assessment – the Best for RI Challenge – the business practices of participating companies are evaluated in five key areas – governance, workers, community, consumers and the environment. Participants are then able to develop targets for improvement, and receive free assistance from Social Enterprise Greenhouse to help them meet their goals. 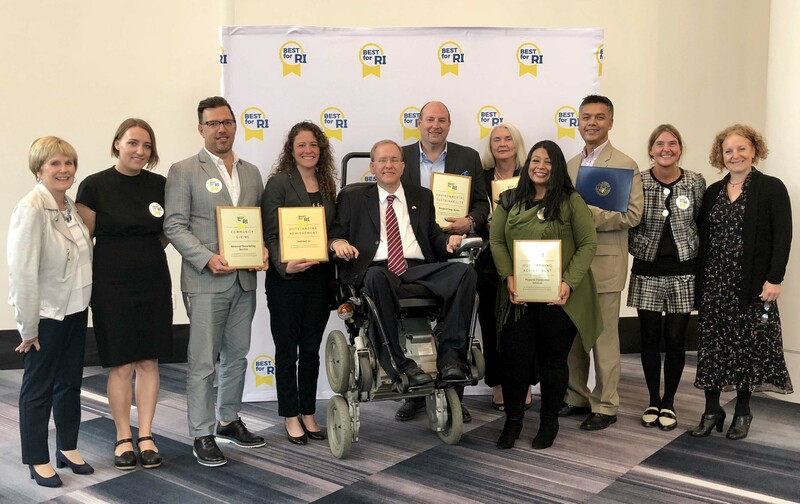 Best for Rhode Island is an initiative of Social Enterprise Greenhouse in partnership with Greater Providence Chamber of Commerce, Rhode Island Commerce Corporation, and a coalition of business and community organizations across the state. The program and online assessment were developed by B Lab, the nonprofit organization that created the highly regarded B Corp Certification. B Lab’s “Best for” program is currently being piloted in three other locations in the U.S. – New York City, Philadelphia, and Colorado – and other communities are in the planning stages for launching their own “Best for” programs. The awards celebration was presented by Kelly Ramirez, CEO of Social Enterprise Greenhouse, and Mark Marosits, SEG Board Member and President/Co-Founder of Worldways Social Marketing. “SEG’s ultimate vision is to continue to make RI the best place to launch and grow an impact business. A little over a year ago we realized we needed to better engage the business community to make that happen. We launched Best for RI in an effort to capture, encourage and nurture all the great work that businesses are doing to make our communities better and stronger. Business is a force for good,” said Kelly Ramirez. To administer the awards, Mark Marosits was joined on stage by sponsors Melissa Cummings, Executive Vice President and Chief Customer Officer at Blue Cross & Blue Shield of Rhode Island and Wendy Werve, Chief Marketing Officer of Virgin Pulse. In addition to the outpouring of support from the business community, The Best for Rhode Island initiative has received attention from state government leadership and our congressional delegation. Following the awards, Congressman Jim Langevin granted a special citation to each awardee. The Best for Rhode Island initiative is made possible through generous support from HiRoad, Blue Cross Blue Shield of Rhode Island (BCBSRI), Virgin Pulse, Worldways Social Marketing, and other corporate and individual sponsors. Each of these sponsors is a leader in the movement to use “business as a force for good,” and is helping to position Rhode Island as a great place to live, work, and to launch and grow a socially responsible business. Bradford Soap Works (founded in 1876) creates and delivers innovative solid cleansing and personal care products that help companies build great brands. Customers include Unilever, Johnson & Johnson, Colgate-Palmolive, Dr. Bronner, Method, and many more. Bradford was the first soap manufacturer to be Certified Organic and the first personal care products manufacturer to offer soap using 100% traceable palm oil from Rainforest Alliance Certified farms. They are actively developing additional products that have little or no water content as a way to reduce packaging and carbon footprint. Advanced Remarketing Services is a Middletown based technology company focused on the automobile recycling sector. Automobiles are the most heavily recycled consumer product and ARS’s applications connect consumers, banks, insurance companies and charities to the recycling stream. Their car donation service has helped to raise over $150 million for some of America’s best known charities. ARS has returned over 80% of that gross back to the charities which are considered the best returns in the industry. Blount Fine Foods is a family owned business with roots going back to 1880. The company is a manufacturer and marketer of premium prepared foods, including soup, sides and entrees, for restaurants and retailers nationwide. They have many working groups in action spanning the environment, mentorship, training, mission alignment, volunteer initiatives, and engaging local economies. Over the past several years, Blount has invested in systems to reduce its energy, gas, and water consumption, and the company is engineering all new products to minimize waste and emphasize the use of recyclable packaging materials. half full, LLC helps teams and individuals overcome obstacles in the way of their perceived impossible. Known for its unique facilitation style, half full, llc’s main service offerings include retreat planning, team building and event planning. The team at half full, llc creates a trusted space of non judgement, optimism and inspiration for all teams and individuals to be empowered to move forward. Driven by its values, “half” of the business is about being a for profit business and the “full” is about giving back. half full, llc offers its summer retreats to teenagers at no cost and helps plan the annual Smith Hill Block Party as a way of paying it forward. Pinpoint Translation Services provides professional interpreting and translating services to a wide variety of businesses and organizations in Rhode Island, the Boston area, and beyond. Pinpoint is the for-profit arm of Dorcas International Institute of Rhode Island, a nonprofit with over 90 years of experience helping immigrants, refugees, and the underserved become self-sufficient and fully participating members of our community. Pinpoint prides itself on providing the local community with flawless, fluent interpreting, and precise translating services. and monthly educational events for employees and serve as a clinical site for local colleges and universities. They are proud to have the Parkinson’s Disease Big and Loud Certification, and also have the honor or being the only LGBTQ Safe Zone skilled nursing facility in Rhode Island.